When talking about reduce file size (MB, KB) for digital image (Photo, Picture), many people first think about re-sizing or crop- change the resolution of the image to make it smaller. But how about keeping the same resolution and visual quality, just reduce the file storage size? There's a free image optimization tool provided by Yahoo which can do exactly what we want- it's a online image tool called Smush.it. Smush.it is a "lossless" tool, it can remove unnecessary bytes from image files, without changing their look or visual quality. Once a photo "Smushed" by Smush.it, it will give you a report of how many bytes have been reduced/saved, and provides downloadable zip file with the minimized image files. You can download that zip file to your computer, unzip it, and upload to your website / blog. 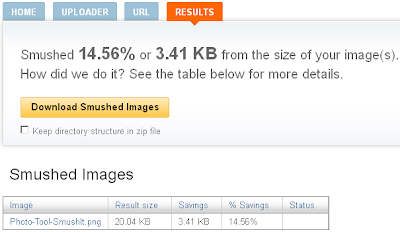 I took a screenshot of the Smush.it homepage, and Smushed it, it gave me following report, which says "Smushed 14.56% or 3.41 KB from the (original) size of your image(s)." Then, I took a screenshot for above report page, and Smushed again, this time it said "Smushed 24.36% or 3.70 KB from the (original) size of your image(s)." If you have a lot of photos on your website, or if you do not want to change your photo dimension, then Smush.it is the perfect tool to reduce the photo file size while keep the visual quality. Step 2: Click on “Uploader” to upload image file from your computer, or Click on "URL" to get a image from another webpage. Once your selected the file, it will give your a report about how much has been Smushed and give you a download button. Step 3: Download the Smushed images by click on the "Download Smushed Images" button. You done. Its that simple! Smush.it is a "lossless" free online tool to reduce the file size of a image file while keeping its visual quality, by removing unnecessary bytes from the file. What's you experience of reduce the digital image / photo / picture size? Have you ever used Smush.it before? What other tools do you use to optimize photos and pictures? Share your experience and insights in the comments box below.